Temperatures hovering around freezing caused lots of ice buildup on the boats! (Jan Walker photo). 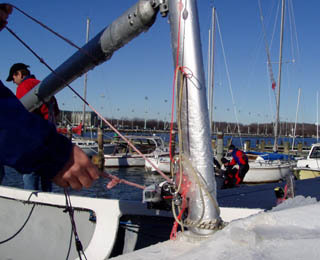 With much of the water in the Northeast better suited to DN sailing than InterClub frostbiting, it came as a surprise to many that the annual InterClub Midwinters would indeed be contested in Annapolis on February 7 &8. However, the IC Midwinters has had a charmed existence, and at the last minute the frozen tundra broke up and washed out into the Chesapeake. Twenty-five teams came from all over the New England, New York, New Jersey, and even Ohio to compete in this unique event which is run like a collegiate regatta. Sailing and socializing in equal proportions is the theme of this classic event. Twenty races in total (ten in each division) were completed in blustry Northwest winds, but the short fetch off the Naval Academy breakwater kept the seas relatively flat. The temperature was cold on Sunday despite abundant sunshine, and icing on hulls and rigs added to the regatta’s mistique. With no drops races, consistency and risk management were vital to ultimate success. The lead changed many times between four teams, and the title came down to the last series. Steve and Jane Kirkpatrick were not having a stellar regatta, but they delivered the goods when it mattered most in the penultimate race by forcing the leading B Division team of Simon Stauss and Lisa Pline into a poor start. In doing so, the Scituate-based team won their third consecutive IC Midwinters by merely three points. Chad Demarest and Whitney Besse sailed a fantastic regatta to capture A Division honors and pull the Scituate team up into the winner’s circle. Saturday morning at 9:30 am Thomas Point had 30 knots from the WNW and there were some real green meanies rolling down Spa Creek. However, after a one hour postponement, we had 10 races in a quintessential 10-20 knot northwester. On Sunday the breeze was down slightly from Saturday (WNW 5-15) but despite lots of sunshine it was a bit colder with temperatures in the 30s), really nice racing.